I’m currently working on a whole bunch of bigger projects, like blankets and comfy pants that will take a while to complete. So Friday night, I was looking for a quick and fun project that I could complete in an evening. I always aim to create something I would actually use myself, so I thought creating a key chain crochet pattern would be a fun idea. 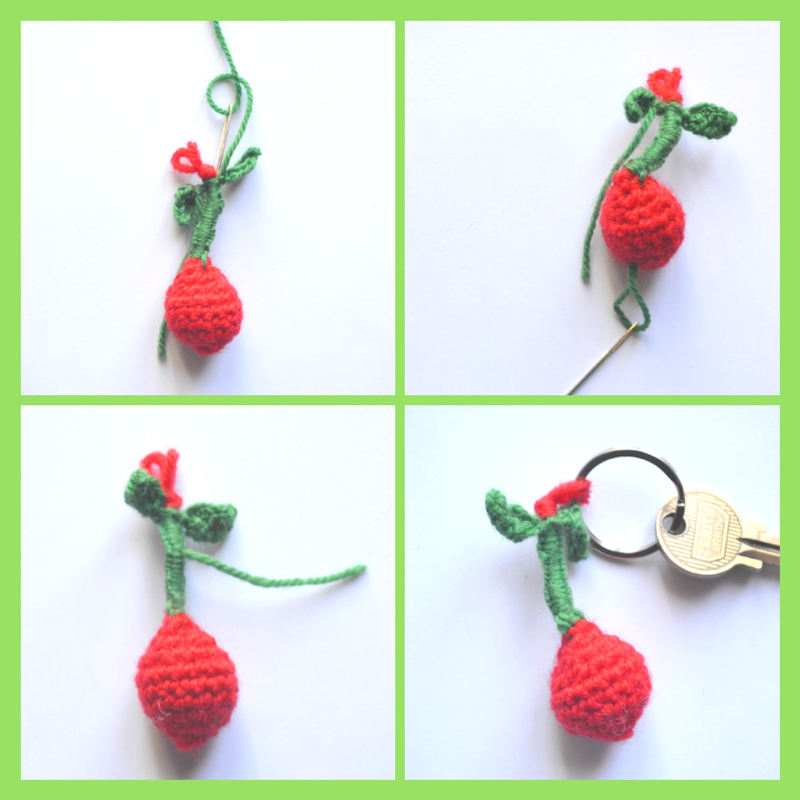 Crocheting fruits always turns out super cute, and cherries lend themselves perfectly to being eating seductively… erm making a key chain. single crochet 2 together (4), join to the beginning with slip stitch. Fasten off leaving a long tail. In order to attach our cherry to a key chain ring, we want to create a loop at the top of the stem. So taking your two long ends you want to make a knot with a loop about 3cm / 1.5″ away from the cherry. 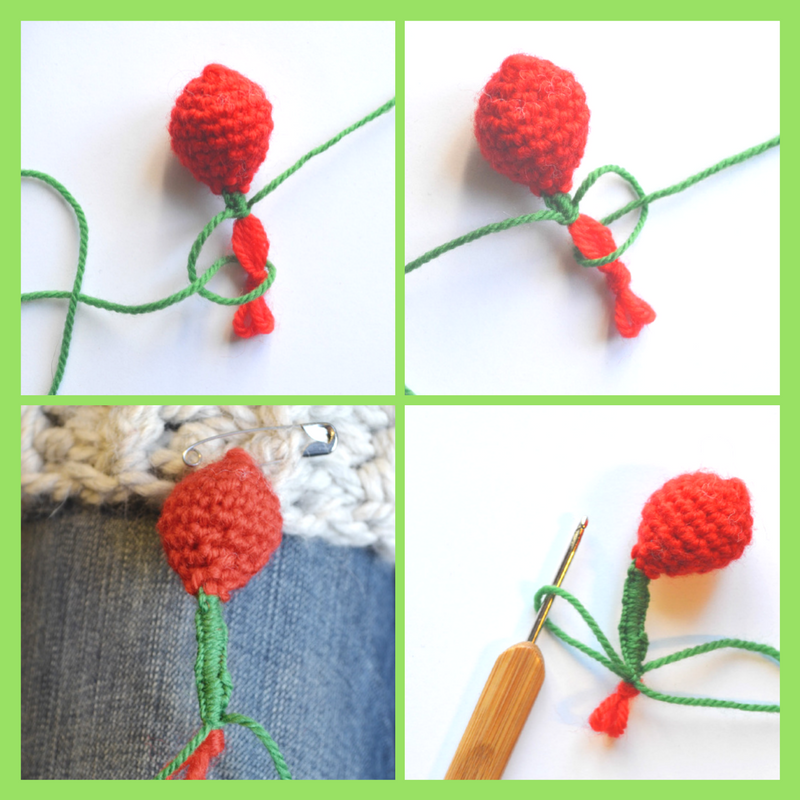 Putting your crochet needle through the cherry and out at its top, pull your ends through the cherry. Cut off the red ends coming out of the berry. You now have 4 strands of yarn connecting the loop to the cherry. 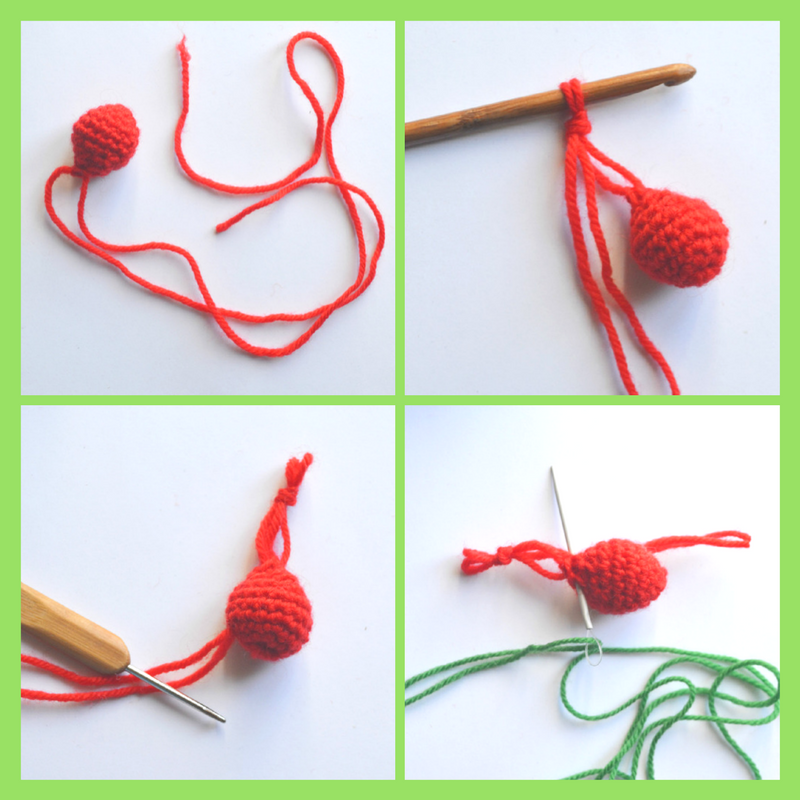 Cut a long piece of green yarn (about 1m / 39″) and pull it through the top of the cherry with a needle so that you have two strands of equal length. To make the stem of the key chain, I ditched the crochet hook and dug out my long lost friendship-braceletting skills I learned in summer camp once upon a time. So with the two strands of green, you friendship bracelet around the 4 strands of red, making one knot with the left strand, then one knot with the right, all the way down to the loop. Remembering my childhood days, I attached the cherry to a beanie with a safety pin and put it over my knee (picture 3 below). That made friendship braceletting a lot easier. Important: For the very last knot on each side, you want to end on a loop rather than pulling the end through all the way (picture 4 below). We will use this loop to start the chain for our leaves. Slip stitch in the last chain and fasten off. Weave in the ends through the stem as shown below. Depending on the length of your end, you can either go through the entire stem and fruit or just through parts of the stem (see pictures 2 and 3 below). Now attach your completed cherry to a ring and you’re all done! Of course, you can also try adding a face to your cherry in true Amigurumi fashion. 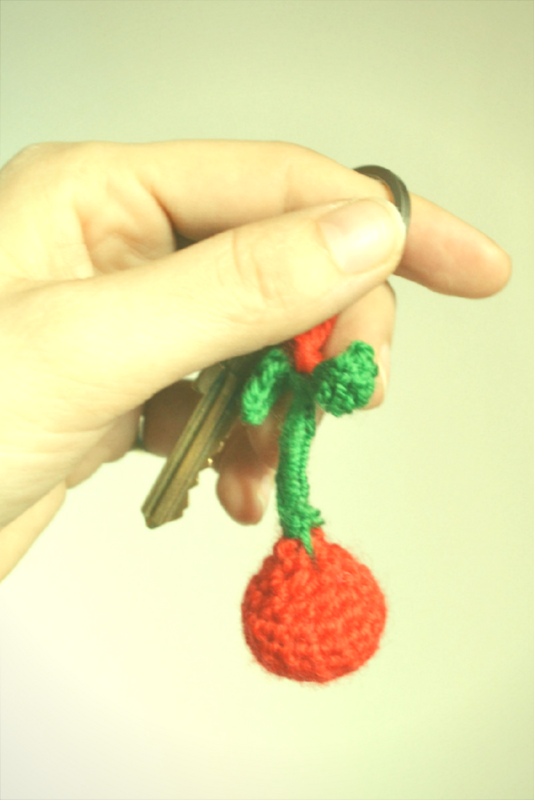 Or you can make a second one two have two cherries for your key. I hope you’ve enjoyed this pattern and will have fun crocheting.